The threads of three great religions—Christianity, Judaism and Islam—are woven into the fabric of Cordoba, one of the most intriguing travel destinations in southern Spain. For insights into the religious and cultural heritage of Spain, you can’t do better than Cordoba, once the capital of the Roman and Moorish empires on the Iberian Peninsula. In the depths of the Dark Ages, it was the most enlightened city in Europe, a center of learning, artistic expression and religious tolerance. Threads of Christian and Jewish history, intertwined with vestiges of Roman, Visigoth and Moorish rule, emerge from every corner in Cordoba’s historic quarter, a maze of narrow lanes snaking between whitewashed buildings. All the city’s check-list attractions lie within this compact district, but it’s also fun to wander and just get lost in the labyrinth, where flower-decked patios, orange trees, iron grillwork and festive cafes typify the gracious lifestyle of Andalusia, the southern region that mirrors our romantic visions of Spain. There’s even a flamenco museum tucked among the courtyards and alleyways of the old walled city. Since my time in Andalusia was limited, I opted for Cordoba (pop. 300,000) over the more popular tourist cities of Seville and Granada. With a limited number of sights compressed into one easily walkable area, it sounded more manageable. I knew I could hit the highlights in less than 24 hours. Cordoba’s location on the train route between Madrid and Algeciras, my next destination, also influenced my decision. And, to be honest, I just naturally go for lesser-known places, not that Cordoba is an obscure backwater. 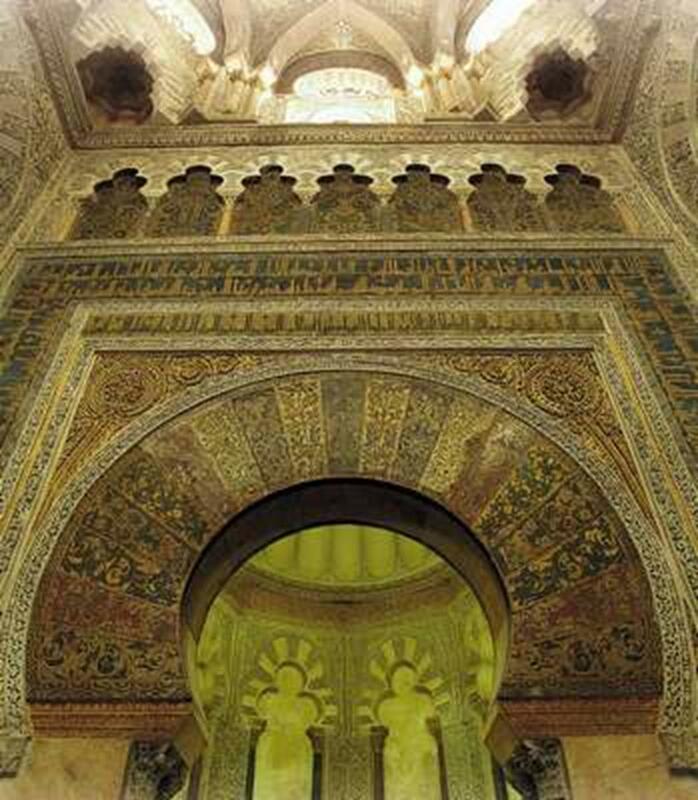 Gold mosaics adorn the mihrab, the portal in which the imam would lead Muslims in prayer. It was the equivalent of a high altar. Combining late-Gothic, Renaissance and extravagant Baroque elements, the cathedral took 250 years to complete. Especially noteworthy are the Baroque-era mahogany choir stalls, each carved with a Bible scene. In addition to the cathedral, where Masses are said daily, there are about 50 chapels around the fringes of the former mosque. A vast forest of columns topped with red-and-white-striped arches dazzles visitors touring Cordoba’s Mezquita, a former mosque that was converted to a Christian church in the 1200s. One can imagine as many as 20,000 Muslims praying on the floor beneath the arches. The jewel of the cavernous mosque is the mihrab, the equivalent of a high altar, where the imam (prayer leader) would speak into the portal, or niche, set beyond a golden-arch entrance and decorated with shimmering gold mosaic cubes. Skylit domes rise above the portal. 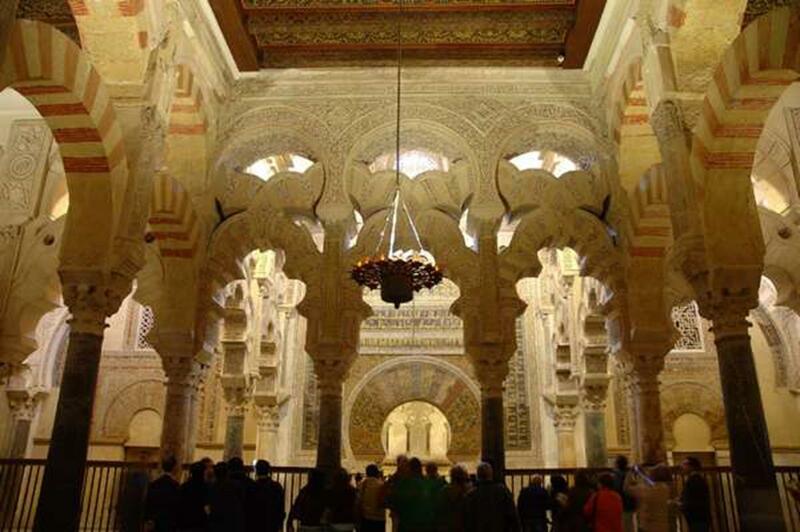 Often considered the most important Islamic monument in the Western world, the well-preserved Mezquita—so vast, so mysterious and fashioned from such a jumble of styles over the centuries—is hard to wrap your head around. A good tour guide or guidebook can help. So can the hand-held audio-guides available for rent. 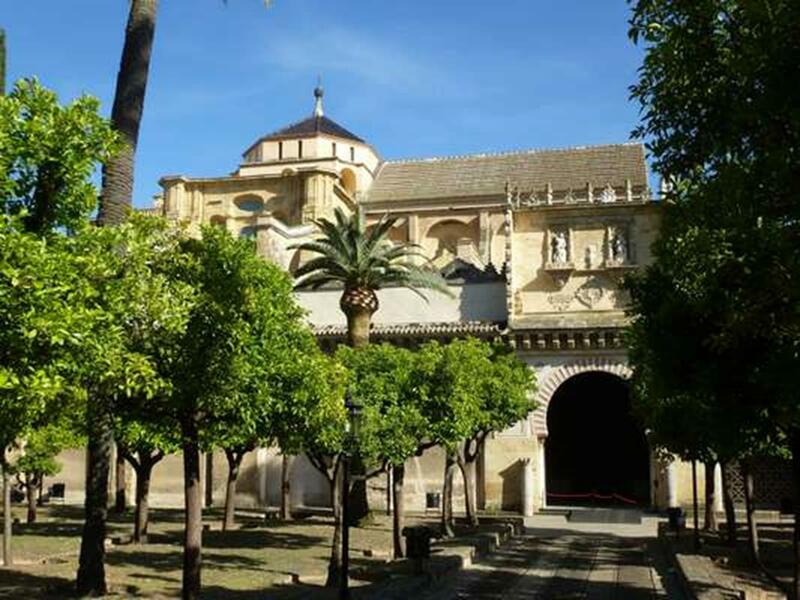 The Mezquita’s main entry point is the spacious Patio de los Naranjos (Courtyard of the Orange Trees), cobbled with river stone and shaded by 98 orange trees, plus palms and cypresses. Formerly the mosque’s ablutions area, it was where worshippers would wash in preparation for prayer. Look up and see the bell tower, built around 1600 over the remains of the mosque’s minaret. The Mezquita is a short walk from the Guadalquivir River and Alcazar de los Reyes Cristianos (Castle of the Christian Monarchs), where the highlight is a terraced garden with flowers and fountains. Cross the Roman Bridge for good views of the old city and perhaps visit the Museum of Al-Andalus Life with exhibits on Moorish Muslim culture. The medieval Jewish Quarter, or La Juderia, offers flower-filled passageways and patios, along with reminders of the Jewish culture that flourished in Cordoba. The ancient Synagogue, dating from 1315, is the only Jewish temple in Andalusia to survive the Inquisition in 1492, when Jews were expelled from Spain or forced to convert to Christianity. For many years the Jews of Cordoba had lived in harmony with their Islamic rulers – though they had to pay a special tax – and some were ministers under the Muslim monarchs. Others held posts as administrators, doctors, jurists. theologians, philosophers and poets. Spanish Judaism reached its golden age in the 10th and 11th centuries; in fact, Spain was the religious and cultural center of Judaism worldwide. 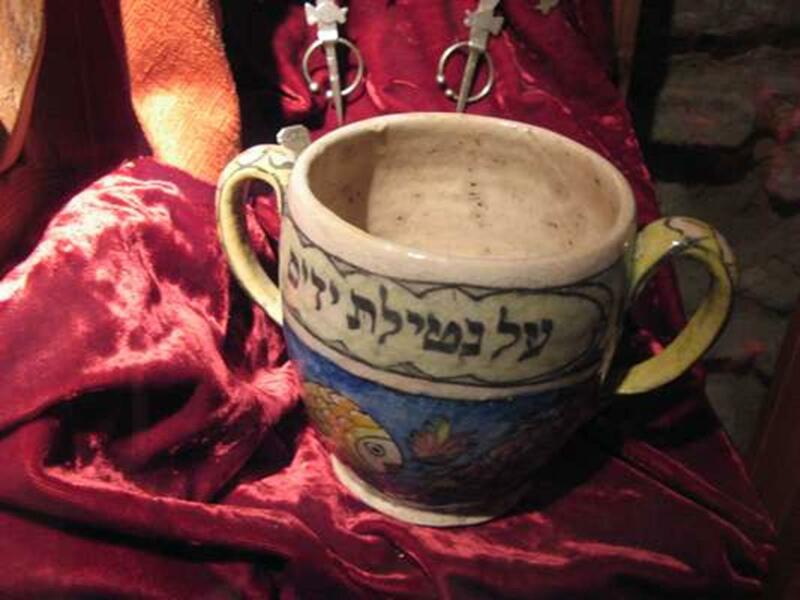 Casa de Seferad displays artifacts representing Sephardic Jewish culture. 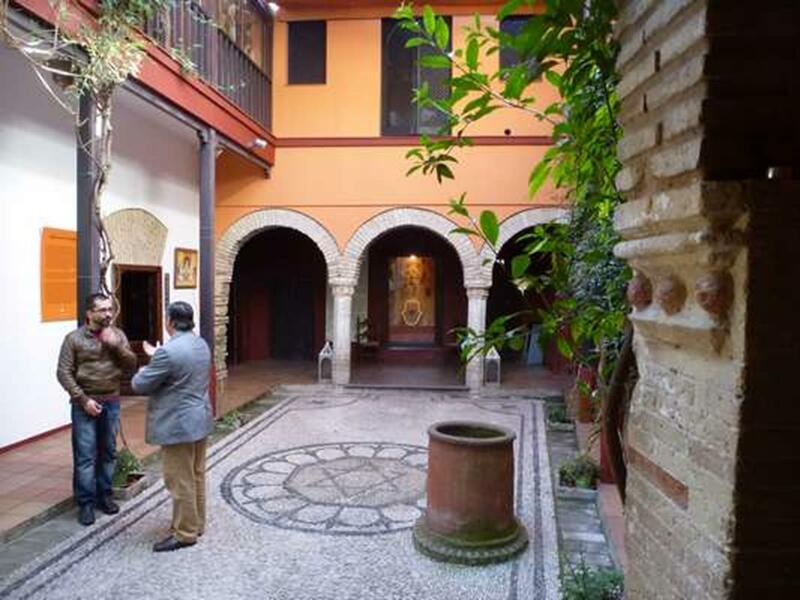 Of greater interest is the nearby Casa de Sefarad, a museum that tells the story of the Sephardic Jews who lived on the Iberian Peninsula (differentiated from the Ashkenazi Jews of Central and Eastern Europe.) In eight rooms grouped around a courtyard, exhibits (with descriptions in English) focus on the role of women, musical traditions, the Inquisition, worship in the synagogue and other aspects of Sephardic culture. (The word Sefarad is Hebrew for Spain.) Because every remnant of Jewish life in Cordoba – and other Spanish cities – was destroyed, the musical instruments, jewelry, household objects and other artifacts are from Turkey, Greece, Morocco and elsewhere. Part of the museum is housed in a 14th century house; the museum itself is only seven years old. The Jewish Quarter is the perfect place to peek into patios—of restaurants, businesses and homes—festooned with roses, flowing bouganvilliea and pots of petunias and geraniums. Some have ceramic tiles, fountains, birdcages and centuries-old wells. Feel the coolness as you pass by these inner sanctums. Also admire the wrought-iron doorways, balconies and street lamps that flank the narrow alleys paved with bumpy river stone cobble and more modern stonework. Calleja de las Flores (Flower Alley) is the area’s most famous street. Many visitors enter the Jewish Quarter through Puerta de Almodovar, the best preserved of the seven original gates in the city wall, which was built upon the foundations of the original Roman fortifications. The old city abounds with other remnants of the Roman Empire. The Archaeology Museum showcases the excavation site of a Roman theater, and near my hotel I walked by Roman temple ruins complete with columns (most of them re-erected). Even in the restaurant of the hotel, Hospes Palacio del Bailio, the glass floor provided a window into the Roman ruins underfoot. With its layers and layers of history, Cordoba deserves more than 24 hours. I just feel lucky I had a chance to skim the surface. 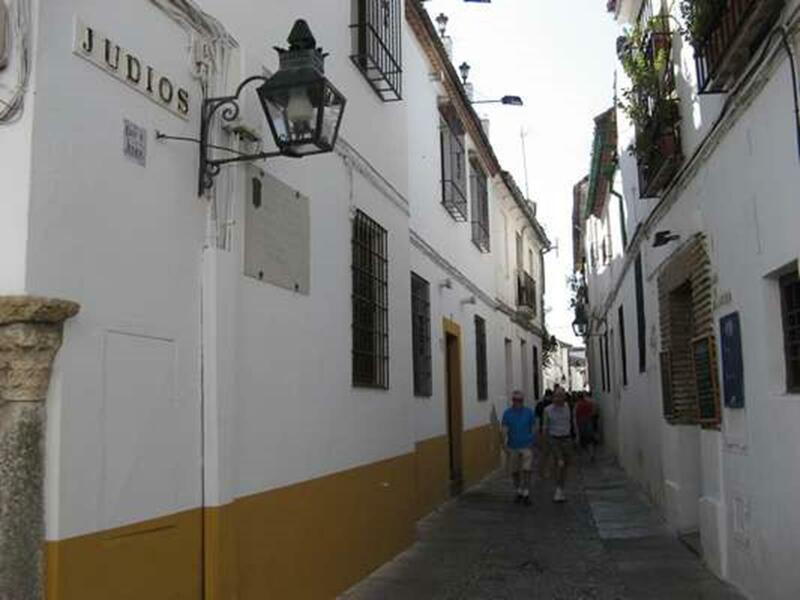 Cordoba is less than two hours from Madrid via frequent AVE high-speed trains, only 45 minutes from Seville.